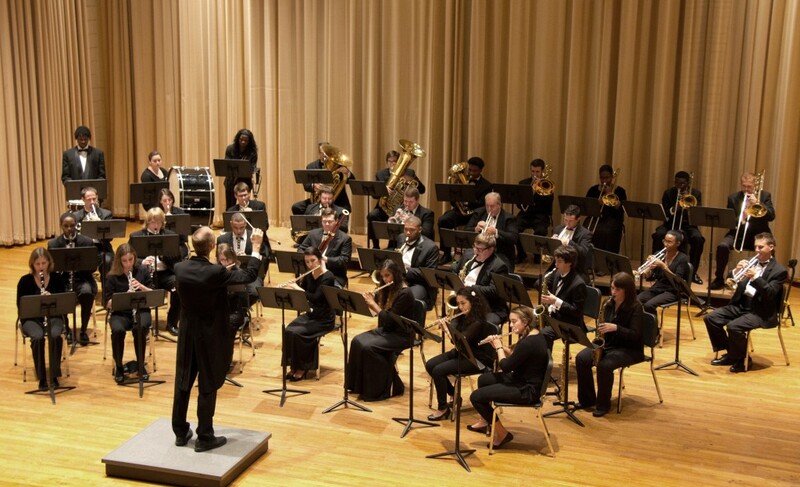 The Jacksonville University Performing Arts Series will present a free joint concert featuring the First Coast Wind Symphony and the JU Wind Ensemble at 7:30 p.m. Thursday, Oct. 13, in Terry Concert Hall on the JU campus at 2800 University Blvd. N.
Both groups will combine to present the featured work on the program, English composer Gordon Jacob’s monumental masterpiece “Music for a Festival,” a work specifically chosen to highlight the fresh acoustics of the newly renovated Terry Concert Hall on the campus of Jacksonville University. This large-scale suite of 11 movements alternates a brass choir with the full ensemble of 100 players. 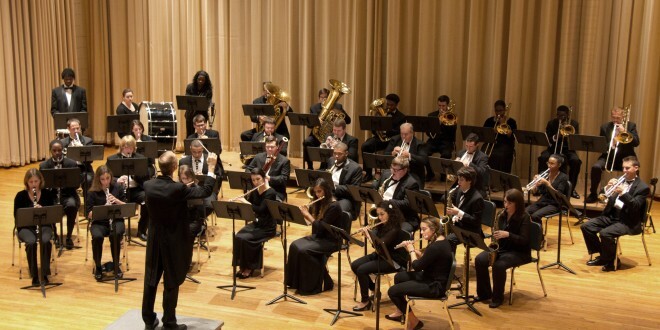 The 50-member JU Wind Ensemble, led by conductor Artie Clifton, JU Associate Professor of Music, is a university group that studies and performs music from the traditional and contemporary wind band literature. The first half of the concert will feature the First Coast Wind Symphony performing music by Strauss, Weinberger, Ireland and Camphouse. Guest soloists Steve Strawley and Jim Malmgren will be featured in the delightful “Trumpet Fiesta” by Donald Phillips. The concert will include Czech composer Julius Fučík’s famous “Florentiner March” in honor of the 100th anniversary of his death and to highlight the accomplishments of Czech military intelligence officer František Moravec, who participated in the planning and preparation of Operation Anthropoid, the WWII mission to assassinate SS General Reinhard Heydrich, the main architect behind the Final Solution and the Reich’s third in command after Hitler and Himmler. This extraordinary story is told in the recently released film “Anthropoid.” Long-time FCWS member Anita Gard, granddaughter of František Moravec, will be in attendance. The First Coast Wind Symphony, a 60-member community music organization led by music director Artie Clifton and conductor Paul Weikle, is in its 27th season. The group provides a cultural service to the Jacksonville community by offering free concerts of quality wind music. The First Coast Wind Symphony has released three albums to wide acclaim, Prevailing Winds, A Christmas Celebration and Symphonic Spirit, and a DVD titled Sounds of the First Coast. The group is a member of the Cultural Council of Jacksonville.